Do porta potties get embarrassed? A framed ornament of my first ever book cover. Both my critique partner & I wrote stories that appeared in Blooming Tree Press' Summer Shorts anthology. I love seeing this on my tree & remembering how hard I've worked at writing for all these years. I place all sorts of knick knacks on my writing desk, mostly so I can play with them when I get stuck. Or haven't quite started yet... I was thrilled to receive this little framed message reminding me simply to WRITE. I loved that the message was composed in kitchen utensils because I also enjoy cooking. The students at Two Rivers High School, where I've been teaching a class this fall, gave me this cute little journal. Now I always love a cute diary, whining, I mean writing, my way through several volumes each year. But this one is extra special because each student wrote a short message to me. I love peeking at the messages--especially on bad days! What are you favorite things to give to writer friends or to receive from writing & reading friends? Yay! (Well, really it's more like phew!) I crossed the finish line, writing 50,510 words by the end of the day November 30th (only because the official NaNoWriMo word counter shorted me 400 words--grrr). I've got an empty box of chocolate truffles, ten patches on my book bag, scary household clutter, and 193 pages to show for my efforts. About those 193 pages... My other three NaNo novels poured out in a lovely organized fashion. Yes, I experienced tough days and needed to do a thorough revision, but at 50,000 words I'd written solid first drafts. Not so much this time. NaNo #4 came out all mixed up. Despite my efforts to outline, organize, and prepare in October, I found myself writing everything out of order in November. My characters kept saying, no, wait, wait. I have to tell you about this first. No, no, no--skip that part and go to this part instead. It drove me crazy! 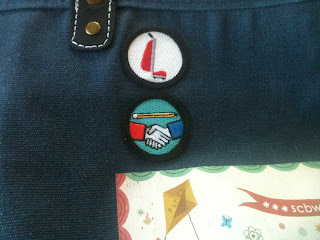 But I was determined to add that "Winner" patch to my book bag, so I muddled forward (and backward). I really have no idea what I've concocted with this mass of pages, but I'm proud of myself for soldiering on through my self-doubt and finishing 50,000 words. Now I'm going to clean my house, pay attention to my family, and read polished work for a week or two. And then I'll look at those 193 pages. I never thought I'd say this, but I can't wait to start revising! I've discovered that I don't really need my thumb to type, begging the question: could a monkey write a better NaNo novel than I've written? The Infinite Monkey Theorem postulates that a monkey, given an infinite amount of time, could eventually type the complete works of Shakespeare, randomly. Well, I don't have an infinite amount of time, even though I do lack an opposable left thumb. I've got two days to make it from 45,172 words to 50,000. Will some of my writing be a tad random? I accidentally added the tip of my thumb to my Thanksgiving stuffing, so I spent my writing time getting stitches. I love writing away from my desk, sipping hot coffee at a crowded cafe, overlooking the mountains from a desk on the 4th floor of the Salt Lake City library, or surrounded by books at a bookstore... But yesterday I found myself typing away in the Toyota service waiting area. Next to a guy slurping strawberry yogurt. No wonder I added a few extra explosions to the scene I was working on! 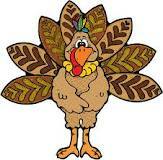 38,665 words written--and now I'm off to bake Thanksgiving pies. 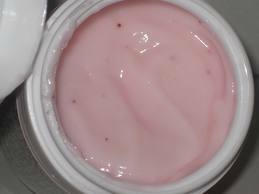 Tomorrow I'll type away while my turkey roasts, but at least that smells a whole lot better than bright pink strawberry yogurt. I've been behind all week. Lost in the middle. Fretting about my whole idea. Not only am I wandering nomad with a laptop--I visited three coffee places before finding an empty table at the bagel shop last Sunday--but I'm lost in the middle of my novel. 28,454 words. But are any of them the right ones?!?!?! Many times during my first week of NaNo writing, people said to me, "I'd love to try it, but I don't have the time to write in November." I don't have the time either. That's what I love about NaNoWriMo. As I head into Week #2, I'm hosting an SCBWI conference & dealing with all those last minute details. Coordinating my daughters' after school activities requires military-level planning--cloning would be even more helpful. I've had fun events, too, like last night's dinner with Two Rivers High Students (amazing kids who are passionate about reading & many who will become authors in time). I even went to the dentist this week. And I still have to exercise, sleep, and feed everyone. I wouldn't have started this novel in November. Or maybe I'd still be dinking around with my first chapter--getting it just right while doubting my whole idea. 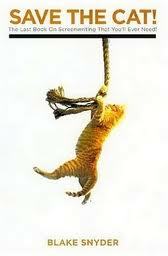 But NaNo has forced me to squeeze writing into my hectic days. We've had homework/writing field trips to the bookstore cafe late in the afternoon. I've woken up early on the weekend. And today I'll probably add to my word count while waiting for soccer practice to end. NaNoWriMo reminds me that I can always make writing a priority--no matter what is happening in my life. I've written 13,583 words so far & I've added two official patches to my book bag. I plan to hit 15,500 today. I'll get to add another patch & I'm sure there will celebratory chocolates too! research, planning & character development--into a novel. 50,000 words in the next thirty days!!! Sierra is the winner of Just Your Average Princess by Kristina Springer!!! Please welcome Kristina Springer. Her new novel Just Your Average Princess is on the shelves now! Please leave a comment to win your own copy. You have been given your Dream Vacation. Where are you going and what are you doing? Traveling throughout Europe for the summer with my hubby and kids. And the kids are all way well behaved: no one is fighting, they are feeding and dressing themselves and wiping their own butts. Bliss! What if you could travel to a different time period? Ooh, shoot me off to the future please. I’d like to see what’s up 100 years out. What's the worst thing that's ever happened to you on vacation? On the last day of our big Disney trip, Hubby lost our car keys on the Tower of Terror at Hollywood Studios and we couldn’t get into our car to get to my 8-year-old’s big birthday celebration dinner back at the Crystal Palace in Disney World. Solution? We piled the six of us into a friend’s minivan with the four of them (yep, ten of us), and all of their luggage, and made it to the dinner only a little bit late. Hubby went back to Hollywood Studios later that night and found the keys in the lost and found. Yay! We drove back to Chicago that night. Kristina Springer is also the author of The Espressologist, a A Society of School Librarians International Book Award Honor Book, My Fake Boyfriend is Better Than Yours, which Meg Cabot calls, “Irresistible as a fluffy kitten. I laughed out loud and so will you!” You can visit her online at www.kristinaSpringer.com or follow her on Twitter @TinaSpringer, or friend her on Facebook at facebook.com/KristinaSpringer. Please leave a comment to win your own copy! To me Halloween has always meant witches. As a kid, I dressed up like a witch almost every year, and now that I'm advancing in age, I invite my fellow crones to a special Witches Luncheon on Halloween. Naturally my creepy baking traditions are witchy too! Now set this mixture aside. Set this mixture aside too. Step #4 Now combine the sifted dry ingredients with the water/oil/vinegar mixture. Beat on high until smooth. Note: the batter will be a tad thin & won't taste as rich as many chocolate cake batters. That's okay, I promise! Fill your cupcake liners about 1/3 full with the chocolate batter. Top each with a heaping spoonful of the cream cheese mixture. Bake for up to 30 minutes until a toothpick comes out clean, or the cream cheese on top turns a golden brown. Frost with cream cheese frosting, tinted your best witchy green. To create the witches, you'll need: peanuts in the shell, candy eyes, red gummy candy (cut to make mouths), mini chocolate chips, and black shoe-string licorice. The Creepy Cake N Bake-a-Thon is ON! Vote for your favorite entry by commenting below. You can comment on EVERY Cake N Bake post, one entry per post, for a chance to win a $20 gift certificate from Barnes and Noble or an official Creepy Cake N Bake doll! Please include your email in order to be entered to win. Trophies will be awarded on Halloween for the top creeptastic creations. Winners will be chosen by our special Celebrity Judge, Adam Rex, author of such deliciously creepy creations such as FAT VAMPIRE, FRANKENSTEIN TAKES THE CAKE, FRANKENSTEIN MAKES A SANDWICH, and PSSST! Thanks for joining me for our Creepy Cake N Bake! 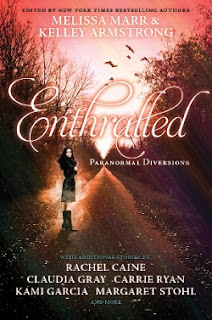 Debi Murray won a copy of the Enthralled anthology! You have been given your Dream Vacation. Where are you going & what are you doing? Scotland! I would spend a week in Glasgow, then travel the highlands and islands. Ooh, I’d go to the 1940s, when men wore fedoras. They looked so cool. Are you a planner or a seat-of-the pants traveler? I’m a planner, but I like to leave a certain amount of wiggle room for spontaneity. Also, I forget to do things, so often the spontaneity is forced on me. Well, it didn’t happen to me directly, but my husband got the flu on our honeymoon. The only fortunate part was that our honeymoon was three months after our wedding. He missed the first couple of days while I went out on bus tours and stuff. He still gives me guilt trips, in a joking way, for leaving him behind in the hotel room. 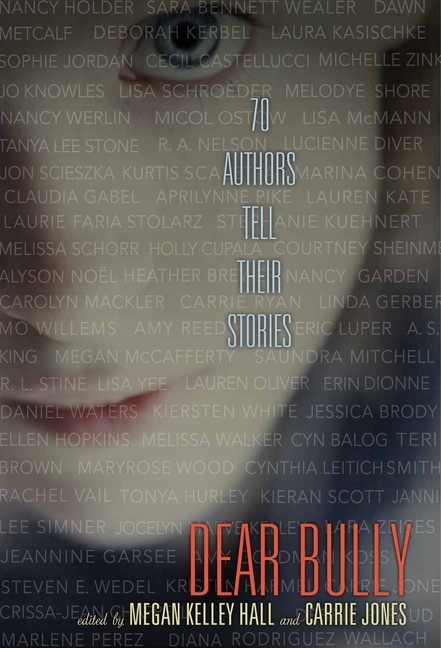 This collection of original paranormal YA short stories grew out of the 2010 Smart Chicks Kick It Tour, a multiauthor, multicity, author-organized tour of the US and Canada. With it, these 16 authors hoped to bring a little taste of the Smart Chicks experience to readers everywhere. In the world of the SHADE novels, everyone seventeen and under can see and hear ghosts, but no one else can. So when Logan Keeley dies and his eighteen-year-old brother Mickey blames himself, they can’t ease each other’s pain or reconcile their rage. Over the course of SHADE and SHIFT, Mickey sinks into a near-suicidal depression over Logan’s death. “Bridge” is the story, told in free verse, of how two brothers, with the help of a stranger, forge the chasm between them to find a lasting peace. Jeri Smith-Ready has been writing fiction since the night she had her first double espresso. Her nine published books include two series for adults and the SHADE trilogy for teens, about a world of ghosts only the young can see, which concludes May 2012 with SHINE. Like many of her characters, Jeri enjoys music, movies, and staying up very, very late. Visit her at www.jerismithready.com, or on Facebook (www.facebook.com/JeriSmithready) or Twitter (http://twitter.com/jsmithready), where she spends way too much time. Logan himself can be found on Twitter @keeley_logan, as can his rival/”brother-in-pulp,” Zachary Moore (@moore_zachary). The boys love to chat with each other and with their real-life fans. 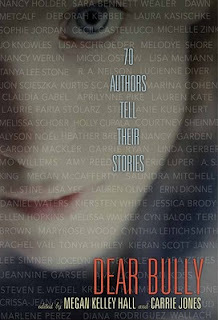 Maryanne is the winner of the Dear Bully anthology. In 4th grade my daughter watched a fellow classmate endure constant bullying--and it traumatized her. She didn't want to tell anyone because she worried the group of girls would turn against her too. When I stepped in to help, the school handled the problem in the worst way possible. The teacher never responded to me, but asked the principal to call both my daughter and the victim into her office. My daughter had no idea why she was in the principal's office. And the victim, a boy, had to tell the principal what had happened in front of my daughter. Talk about humiliating! Despite efforts to end bullying, it's still a huge problem for so many kids. That's why I'm pleased there's a new anthology addressing this issue: Dear Bully. Please leave a comment to win a copy. My task this week: plan and plot my new WIP. I know, I know, outlining is not cool, not artistic, it hampers inspiration... Tony Hillerman says, "Usually the book is finished long before the outline is. Go with the flow. 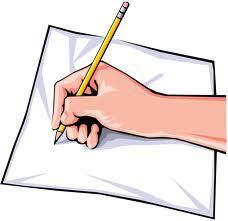 Sometimes plots don't make sense, but it avoids that awful problem of outlining." Anne Lamott (Bird By Bird) is against outlining. So is Stephen King (On Writing). But I still love it. I'm not talking about one of those big I, little i nightmares from school research papers, but rather creating a plan for the work I plan to write, or as Strunk and White say, "a suitable design." Having an outline gives me an advantage as I draft a new novel. Advantage #1: Plot. 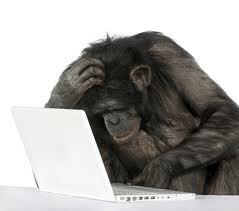 Outlining allows me to work out the structure of the novel. I like to see everything visually and puzzle out questions. If this happens, then what will happen next? I can see the pacing, story arc, etc. Advantage #2: Avoid Meandering, Wandering, Getting Lost. An outline helps me keep to the story I intended to tell. I won't write hundreds of unnecessary words, or pages, that don't actually contribute to my main character's journey. Sometimes it's hard to cut clever or pretty sentences that sound good--even if they don't belong. A good outline also gives me a map through the middle. Knowing where I'm going prevents those panicky moments, "Eek! I've written 100 pages, but I don't know what happens next, and, maybe the whole thing is bad, bad, bad." But--it is important to be flexible. I'm always adding and deleting things from my outline. Advantage #3: Tracking Subplots, Minor Characters, Themes. To make outlining even more fun, I'll use color for each aspect of the story. At a glance I can see if I'm ignoring a subplot for too long, or leaving out a minor character who will confuse my readers if she all of a sudden pops back into the story 75 pages later. Advantage #4: Remembering The Good Stuff. I do a lot of research before I write, and I'd probably forget about some of my most interesting tidbits if I simply dove into the story and started wandering about. Outlining forces me to really think about my story and figure out how to fit all of my ideas into my plot in an exciting, relevant manner. Advantage #5: Fast, Smooth, Writing. I rarely sit and stare at my blank computer screen wondering what the &#*! @ happens next. I've been letting my subconscious mind go to work. I always look at which scene I'm going to work on the next day, and think about it while I'm cooking dinner, driving carpool, walking the dogs, etc. I'm not worried about what will happen next, I'm focused on how to make it happen. Advantage #6: Cleaner First Draft. My outline serves as a first draft of sorts. And that makes revision easier. Oh, I still have things to fix, but I usually don't need a bulldozer during revision. So what if Stephen King thinks I'm a dork? Today my goal is to create a pitch for my next YA novel idea--something so intriguing that people will say, "I've got to read that. Write fast!" Lucky for me, I discovered Save The Cat by Blake Snyder. It's a book about screenwriting, but who better to teach me how to pitch than a Hollywood movie guy? According to Snyder, a pitch answers this basic question: what is it? A good pitch gives a clear sense of what the story promises to deliver (action, love, mystery). You want your audience to immediately form a compelling mental picture of your story. Better yet--you want to elicit an emotional response. A good pitch also includes a good title. Hunger Games? Yeah, I want to know what that's about! People also want to know who the story is about. Short and sweet, a good pitch characterizes both the main character and the antagonist. Is your character's goal enthralling? The best way to hook someone with your pitch is to make sure that your character's mission involves primal needs: survival, love, protection. Snyder asks: would a caveman understand your character's needs? Reducing all my research into a pitch only a few sentences long will probably be the hardest part to write. But I know that figuring out these basic elements will make the next 250 pages flow. I'm excited and I want to write this story fast! Mom says she's hoping my life will turn into a walk-off homer in the 9th inning of my twenties, otherwise I'll have to revive her broken heart with CPAP. "You can't treat life like a duathlon," she says, "if you're not even bothering to enter the race." "I'm gonna apply for that robocall job, I swear." "Not if you don't get off the couch." Mom picks up her smart phone and whips up some crowdsourcing for her m-commerce vitamin business. She's always attached to some sort of electronic device, so I don't get why she bugs me about wasting time on social media. She tweets more than I do, hoping to sell supplements to parkour participants. Talk about a boring job! I mean, it's not like I'm fist-bumping my buddies about being a boomerang child. And Mom's wrong about me going after the cougars in her book club, but could she blame me? My only relationship is a bromance with an old high school classmate based on our shared fondness for Americana banjo music. Maybe I'm not doing the most I could with my life. But it's totally Mom's fault for being such a helicopter parent! So what's your favorite official new word? One of my favorite neighborhood "characters" is a man who walks three little dogs every morning. With his dark shoulder-length hair, bushy beard, and old-fashioned coat, he looks like someone from another era. He should be wandering cobblestone streets in the mist, not dodging early morning sprinklers watering manicured lawns in a dry climate. 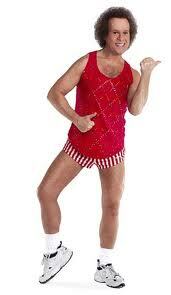 But today I saw him walking his three little dogs, wearing shorts--Richard Simmons shorts. Oh, no! It turns out he's a man from another era alright, but that time is 1980! Well, at least he can still be a time-traveling nomad in my imagination. Yesterday I dropped my daughter off for her first day of 10th grade. Usually I drive away cheering the return of long uninterrupted writing days, but yesterday I found myself growing tearful, a bit nostalgic. In 10th grade I started becoming myself. That year I began keeping the daily journal that would eventually give me the courage and voice to write fiction. I also started fighting against my failures. After a truly embarrassing drill team tryout at the end of freshman year, I decided to take ballet lessons and try again. I dragged my curvy post-pubescent body to a class of slim 5th and 6th graders. But I did make the dance team the following spring. And I've been working to overcome my failures ever since! So while I happily dig into long days of writing, I'm wondering who is my daughter about to become? Trudy won a copy of Love Story by Jennifer Echols. Yan won a copy of A Need So Beautiful by Suzanne Young. Please welcome Jennifer Echols, author of Love Story. Leave a comment and you could win your own copy! I am going to Hawaii and learning to surf. I’ve been to Hawaii before, so I know how beautiful it is, and learning to surf is the only thing on my bucket list. I think I would stay here. So many people nowadays lament the loss of “the old days” and “old-fashioned values,” but I look around and see how much better off we all are than before. My husband and I are not of the same race, so we couldn’t have gotten married and had a child too long ago. In theory, I’m a planner, but my vacations never work out that way. I plan to plan, but then I get busy and wait until the last minute. And even on the rare occasions when I do have time to plan, I like to build in time for unplanned wandering. I don’t feel like I’ve been to a place until I get away from the tourist attractions and see where the people actually work and live. I convinced my friend Amy that we should go on a ski slope that was too difficult for us, and she ran into a tree, which tore her earring out of her ear. I documented this in my novel THE EX-GAMES and dedicated the book to her. 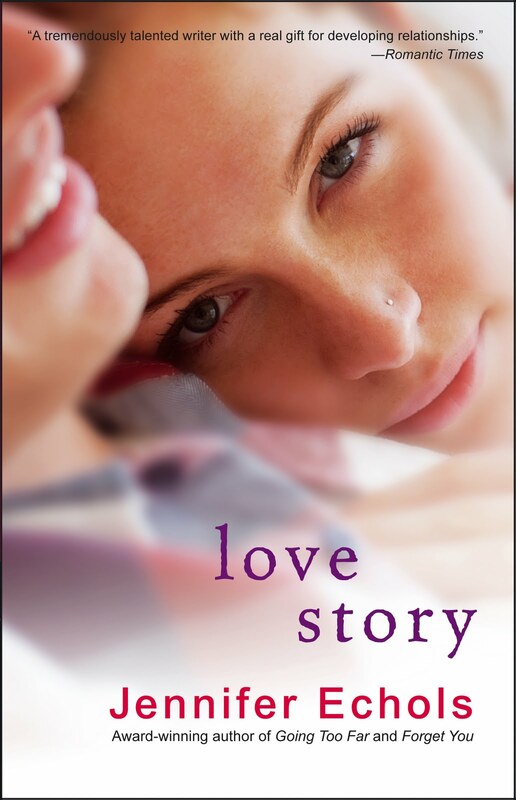 Leave a comment and you could win a copy of Love Story! 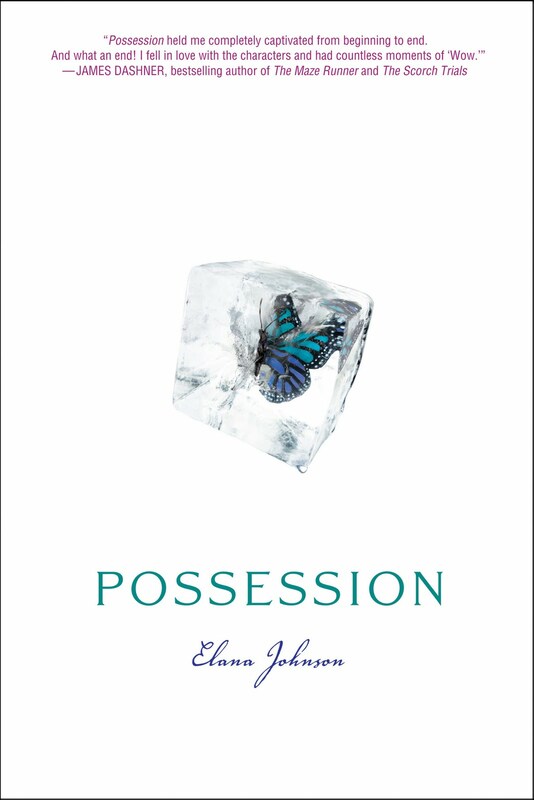 Yan wins a copy of Possession by Elana Johnson! Please welcome Melissa Walker! Leave a comment to win a copy of her new novel, Small Town Sinners. I'm going to Spain, first to sit on the beach in Andalucia, then to spend a few days in Madrid, a city I love almost as much as NYC. I'd go to the 1920s, if only for the style. I love a vintage flapper dress. I'm a mix. I like to get flights and hotel in order, but for the day by day I go with what I feel like doing in the moment. Flying back from Brazil once, we almost landed at JFK but then had to divert to MIAMI! I spent four hours on the runway there before flying all the way back to NYC. Luckily, I had a good book--Middlesex by Jeffrey Eugenides--to keep me distracted. And actually, I feel lucky that this is the worst thing that's happened to me while traveling--not so bad! Small Town Sinners is the story of Lacey Anne, daughter of the pastor and perennial good girl, who is eligible for a lead role in the season’s Hell House production—a role she’s been coveting for years. But when Ty moves to town as casting begins, a new perspective is added to Lacey Anne’s world and she starts to see her tight-knit, Evangelical community in a different light. With the help of her two best friends Starla Joy and Dean, and her potential first love Ty, Lacey Anne begins exploring her own thoughts and feelings about her religion, her community, and her place within both. While this novel deals with provocative issues like religion, teen pregnancy and underage drinking, it is not an “issue” book; the topics are masterfully interwoven into this story of friendship and family. Read an article about the book in the New York Times Book Review. To win a copy of Small Town Sinners, please leave a comment! YA Vampire Books has won a copy of Amanda Ashby's Fairy Bad Day! It’s not always about you. When my first novel hit the shelves, I came across a surprisingly violent review: a blogger, upset with a particular passage, threw my book against her wall! Shocked and dismayed, I showed my mother, a psychologist, the review. She simply nodded and said, “Wow. That sure says a lot about her.” Oh, right. Readers filter stories through their own experiences, values, and expectations. Sometimes our work simply won’t connect—with anything other than a wall. To read the rest of my guest column, please go to the Guide To Literary Agents blog. Leave a comment for a chance to win a copy of Jungle Crossing. Please welcome Suzanne Young. 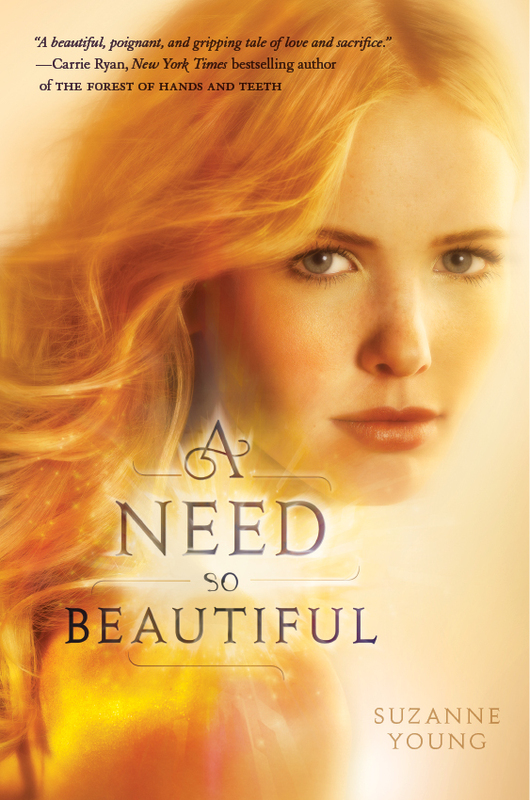 Leave a comment to win a copy of her novel A Need So Beautiful. I would love to go to Italy. I just want to wander and take in the sights, eat good food, study the architecture of the buildings. I hope to actually make it there one day. I've always been fascinated by history, but I don't know... time travel sounds dangerous! I love traveling but haven’t been able to do much of it lately. I like to just go somewhere spur of the moment when I can. On the way back from the Grand Canyon we were in an RV and nearly got trapped driving up a mountain range. I cried the entire time because I thought we’d end up on an episode of I Shouldn’t be Alive. « "A clever and well-written fantasy. Whether Charlotte is an angel or a being less freighted by religious tradition is left up to the reader, but the dilemma of how we can make a lasting impression is a very human concern. Young offers an elegant solution that is well worth consideration." Please leave a comment to win a copy of A Need So Beautiful. Today I'm pleased to welcome fellow Utah author, Elana Johnson. Leave a comment to win a copy of Possession. The White Cliffs of Dover, and I’m just going to absorb the awesomeness of the UK. Well, if it involves a plane, then I plan. If it’s a road trip, I’m a pack-a-bag-let’s-get-in-the-car! kind of planner. Hmmm…we had to buy new tires on our last road trip to Arizona. So we did. I live in Utah. They don’t sell tires in AZ. So about six months later, I had to buy new tires again. Yeah, not my best vacay. Leave a comment to win a copy of Possession! Today I'm pleased to welcome Amanda Ashby. Leave a comment to win a copy of her new book Fairy Bad Day. Oh, I love this game! I would go to Italy because I still regret that I somehow skipped it when I was traveling through Europe—okay, I didn’t skip it, I just forgot to get out of the train on the way to Greece (which considering the trip was something like 20 hours is a little bit stupid!) Anyway, I want to have about three or four weeks so I can do Tuscany as well as Rome, Florence and Vienna, and obviously apart from seeing lots of amazing and very worthy things I will eat gelato all day everyday! Regency period just to see if it was as awesome as Georgette Heyer made it out to be! I’m a panster who wishes that she was a plotter so I try my hardest to plot but it NEVER works. My brain just likes to through sensible suggestions out the window and change its mind ALL the time! We were on a train going through Spain and hadn’t validated our Eurorail passes so that they would last longer. We thought we could act dumb and pretend that we didn’t know we were meant to if we got caught. We did get caught and it turns out that Spanish train police have NO time for tourists who act dumb. We got away with a caution, though for awhile we thought we would lose our passes, which had cost a lot of money. We definitely never made that mistake again. She has a degree in English and Journalism from the University of Queensland and is married with two children. As well as writing, she works part-time at the children/teen desk of her local library, which basically means that someone pays her to talk about books. Her debut book, You Had Me at Halo was nominated for a Romantic Times Reviewers Choice award, and her first young adult book Zombie Queen of Newbury High was listed by the New York Public Library's Stuff for the Teen Age 2010. 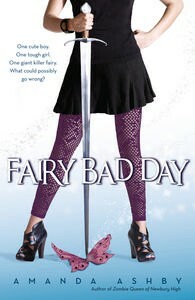 To win a copy of Fairy Bad Day, please leave a comment! I'm just home from a jaunt through the Northwest. I brought books, notebooks, and my laptop, but I didn't do any writing work. I simply appreciated other people's creativity. Watching others exercise their creativity always inspires me. So now I'm home with my notebook, adding characters like this cat who does fundraising for an animal shelter at Pike Place Market in Seattle.